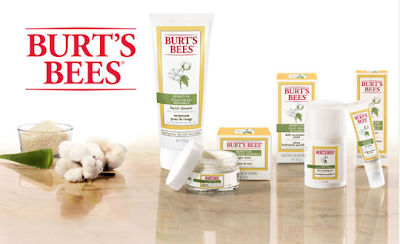 Home » Beauty , review » Burts bees Review! This was a product name i hadnt heard in years! I was estatic that i was being givin the chance to try out a new line from burts bees through bzzagent. i was never expecting full size products but i recived 2 full size products and cute samples attached to a card (to share). one of the products i was given was burt's bees daily moisturizing cream. I have sensative skin using other products on my face would turn my face really red and make it extrealy irratated, i found when using this product i did not feel any discomfort at all it went on smooth and the best part about it was that it does NOT have a fragrance smell. the best part is that its all natural made with cotton extract. after about a week i noticed my face was not so dry all the time and it actually felt nice and refreshing. I also got to try the Fascial clenser. OMG when i have used them in the past i had the same results redness and irratation and i stopped using clensers all together. i was honestly hesitant on using this due to past experiance with other products.. i couldnt resist i had to try and am i ever glad i did! its smooth and again no fragrance( love that ) it feels like velvet over my skin. it didnt tighten my skin at all. and it worked. using both these products my face has never been so smooth and appealing. thank you so much bzz agent for letting me try these products. burts bees will be a product i shop for my sensative skin from now on. These products sound great, thanks for sharing!